If you’re a salesperson, realtor, recruiter, or anyone who regularly schedules meetings with people outside your company, you need an appointment scheduler. If you’re unfamiliar, an appointment scheduler is a tool that lets other people choose a meeting time with you based on available times from your calendar. 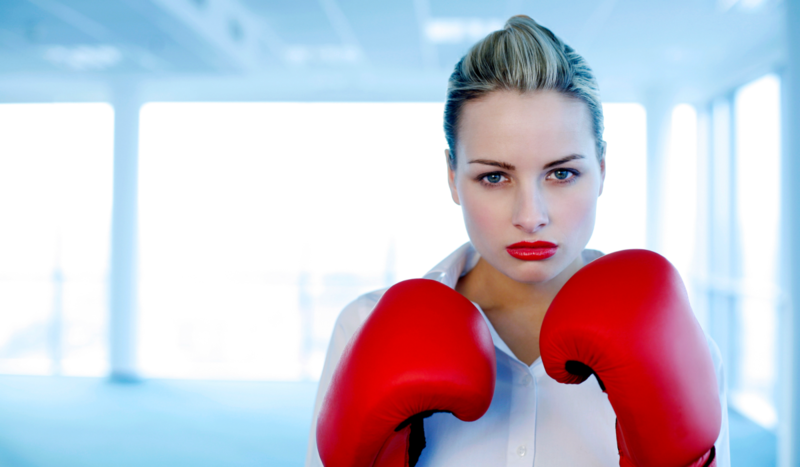 Appointment schedulers eliminate back and forth emails about scheduling. They can also make it 87% more likely that you’ll actually book an appointment with a decision-maker. Some appointment schedulers require a monthly fee, but (as we’ll show in this article) you can get an excellent appointment scheduler 100% free. 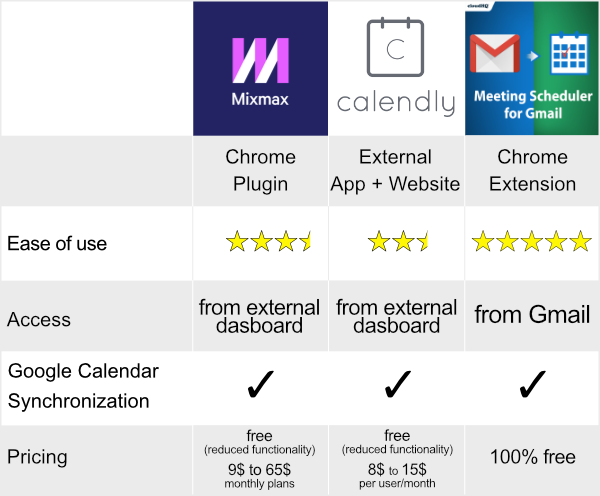 Here’s our rundown of three of the major tools on the market: Calendly, Mixmax, and Meeting Scheduler. Calendly is a simple appointment scheduling app that syncs to your Google Calendar, although recipients can receive an invite from using iCloud, Google, or Outlook calendars. Calendly requires sign-up at the Calendly website and works as a third-party app. 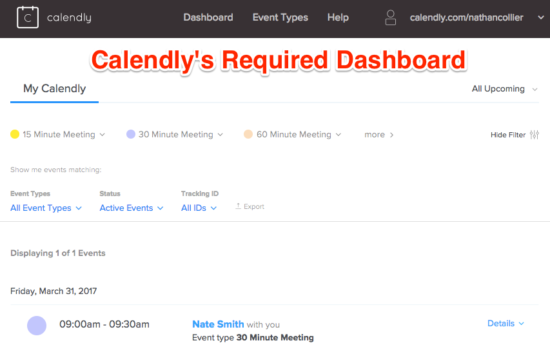 To set your available times and meeting-types, you’ll need to work in the Calendly dashboard. Once times are set, you’ll send recipients your standard schedule link (e.g. calendly.com/yourname). Anyone with your link will be able to schedule an appointment with you. Calendly has a free plan, but for the best feature set, the premium plan will cost you $8 per month. Mixmax is targeted to salespeople and has been designed to help you get appointments with decision-makers from prospect organizations. Mixmax works through a Chrome plugin, one that will overhaul the “compose” window in your Gmail, adding a suite of features over the standard Gmail interface. 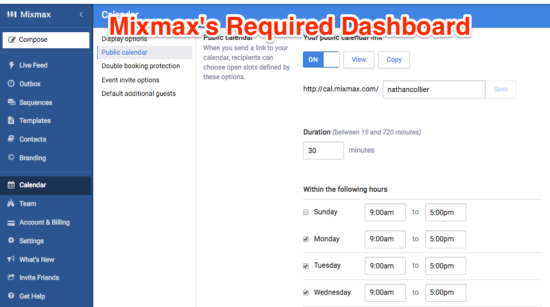 Mixmax has a free plan with a limited number of calendar appointments per month. For the best features, you’ll need the Starter plan at $9/month or the professional plan at $24/month. Meeting Scheduler is a brand new appointment scheduler available for Gmail. It was designed to meet the needs of real business professionals who use Google Calendar—without some of the annoyances common to many appointment scheduling tools like a third-party dashboard to learn… because real professionals don’t have time to learn something new. 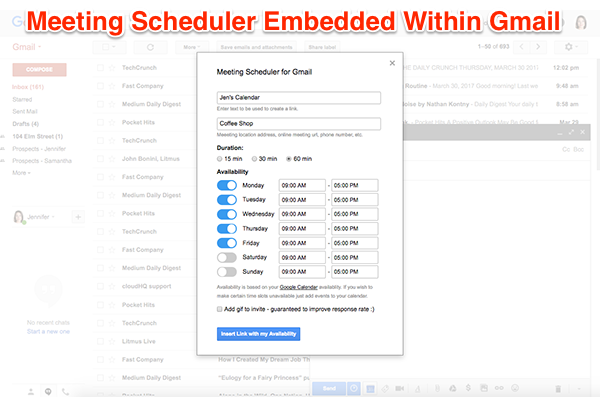 Meeting Scheduler works natively within the Gmail eco-system of tools, where you’re already familiar. It also scans your calendar before offering times to ensure that you don’t get double-booked in your calendar. But what’s also cool is that you can also offer different availability to different people, something that’s very difficult from most appointment schedulers. And finally, also unlike Calendly and Mixmax, the full-featured Meeting Scheduler is completely free for unlimited use. If you use Gmail and Google Calendar, Meeting Scheduler is the easiest calendar scheduler tool available. Install it for free from the Google Web Store or the cloudHQ Chrome extensions page. Get Meeting Scheduler. It’s free..
Share it: Just in time for tax season, we’ve released a new tool that’s magic for your email receipts (ex: Uber, Amazon, Walmart, G . . .
Google is rolling out a new Gmail email web client, with new features including a sidebar, clickable attachments from your inbox, and smart . . .